I’ve had this Grunow 460 sitting in my queue pending for a little while and it’s finally on it’s way home looking great! There was a fun extra bit of detective work to identify and solve the issues that came up along the way. The Grunow 460 was made by the General Household Utilities Company at the height of the Great Depression, in 1934. I follow eBay for Grunow radios specifically and saw a few of these for sale last year and have been curious what they’re like to work on. The cabinet materials do reflect being made at a time when many consumers were incredibly cost-conscious, and this was the most economical radio offering they made that year. The General Household Utilities Company did deliver an attractive design though with the contrasting color diamond in the center of the grill cloth and a light bevel around the dial face. The design is a very simple 4-tube superhet receiver using the tubes 6A7 6F7 42 80. It’s functional, and would’ve worked well enough for daily use in cities with near-by radio stations. The 6F7 tube contains both the pentode section IF amplifier stage and a triode section Detector/1st Audio stage. There’s a lot of space under the chassis but a lot of components are stacked into one side. The chassis tags were in pretty good shape. 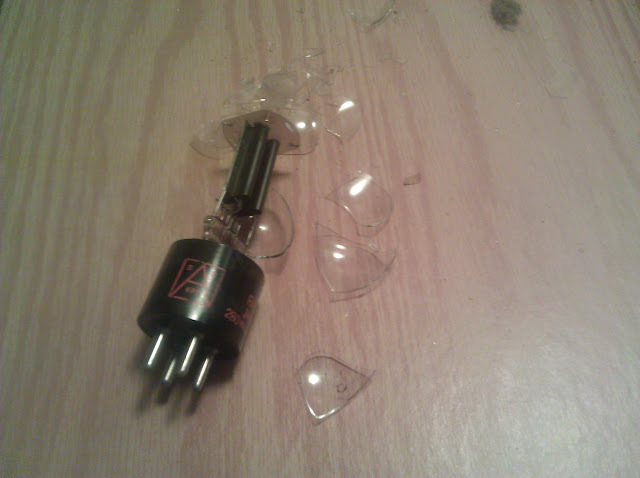 Unfortunately, one tube broke in shipping, the 80 rectifier. It turned out, with further testing, that all 3 other tubes needed to be replaced as well, so this radio got a full set of replacement tubes and should be good to go for many years. This connection to a floating ground lug wasn’t even soldered. The exposed antenna coil was broken in several places and partially unwound. Fortunately, there are universal broadcast band antenna coils available, so I ordered one of those from my supplier and continued working. 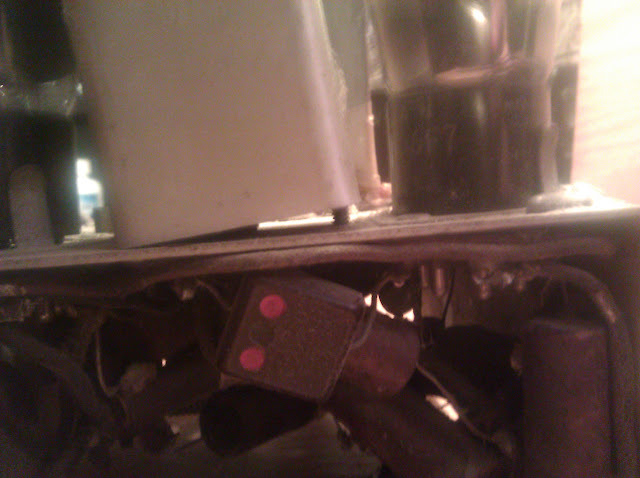 You can clearly see where the power transformer was replaced previously in the radio’s life – the new one uses a vertical core; the stock Grunow transformers use a horizontal core and the bell housing end fits through the chassis. There’s no difference in how the styles work, just a different shape. The replacement is held on with only 2 of the screws since the base won’t line up anymore, but it’s a small transformer and the two mounts are plenty strong. Also note there’s only one visible IF transformer can. Most radios have two (or more) of those cans which provide shielding and protection for the IF transformers. 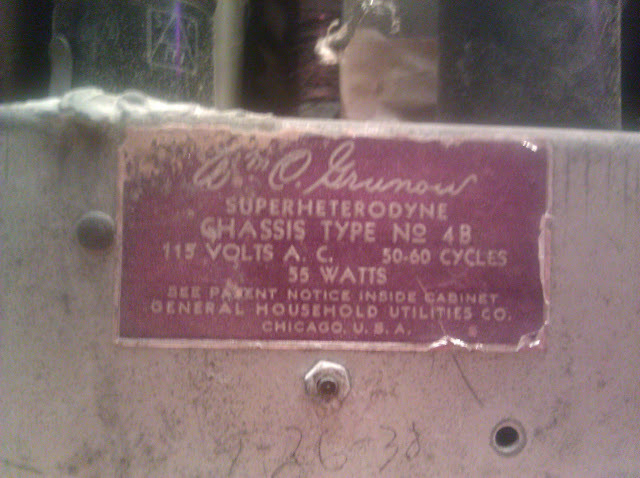 This Grunow has a single shielded IF transformer with the second IF transformer unshielded under the chassis, another way they saved costs in manufacturing and passed the savings onto the consumer. This radio needs about a 6′ wire antenna attached to the white wire antenna terminal on the back. The radio was missing tube shields when it came to me, which were absolutely necessary for proper operation, but I was able to supply them from stock. They’re important to keep the tubes from picking up interference directly, or introducing interference to the other tubes – some generate a fair amount of noise if you leave them unshielded, and you’ll end up with a radio that squeals but can’t receive much else. Not pictured, I also replaced the cord with a new polarized cord, the old one was cracking. That did it! It was time for an alignment. I peaked up the IF trimmers which were off by a fair amount – the volume increased significantly after the adjustment – and fine-tuned the other adjustments. The dial tracks quite nicely within 10kc after the adjustments. I didn’t take photos of this process, unfortunately – doing an oscilloscope stage alignment on this radio would take a lot of time but not give any benefits over doing the classic signal generator/output meter checks. At this point, I had the radio up and playing and was getting ready to send it along when it cut out. Back to troubleshooting. It turns out a section of the candohm resistor had opened. It’s likely it just failed at a terminal lug as nothing was shorting anywhere else in the radio to have caused a damaging current draw, it just died. Fortunately I had resistors on hand to replace it and mounted a terminal strip to use as new tie points. 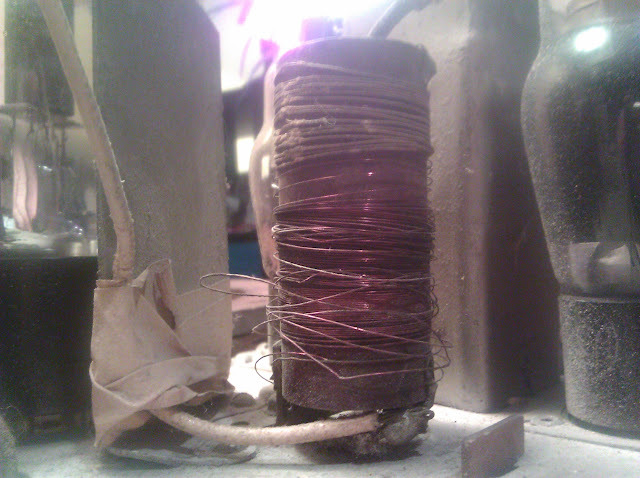 The antenna coil is pretty cheaply made, and the solder lug was only weakly glued onto the cardboard coil form. The glue separated when being adjusted, so I was left with the last resort of wrapping it with electrical tape. It’s not readily visible and doesn’t harm the operation and is the most cost-effective fix for the problem. This one will polish up nicely and look great on its owner’s shelf! 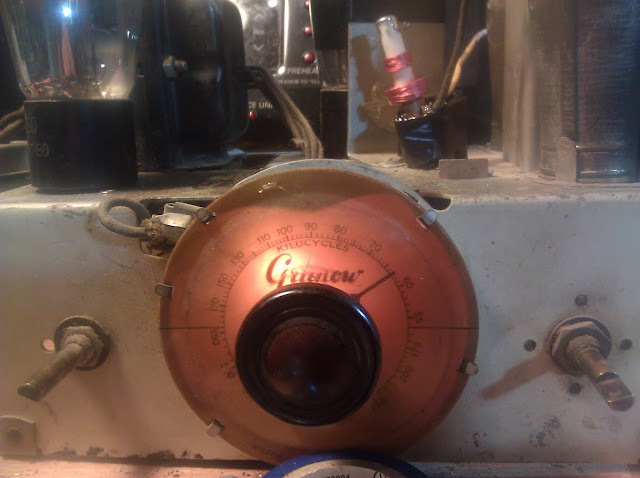 I really like working on these Grunow radios – they have interesting cabinet designs, circuitry that usually has a couple of interesting tricks to it, and very good published schematics. I’ll be fixing up my World Cruiser when my workload dies down a bit. Up next are two more Bose 901 Series 1 equalizers, a Philco 66, and a Silvertone 1708! Expect to see new articles more often than the last couple of months. 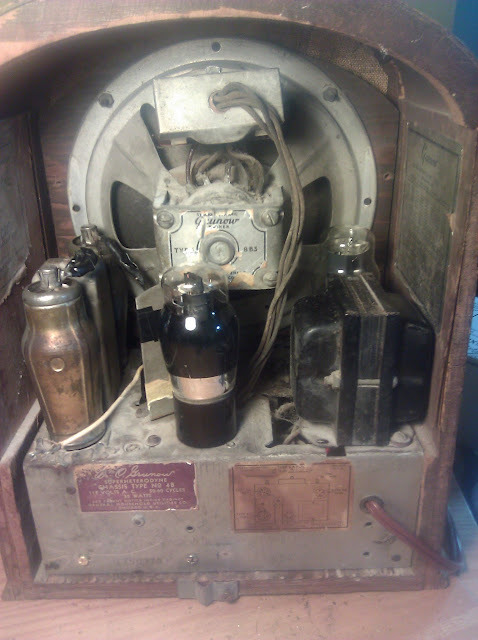 This entry was posted in Projects, Radios and Tubes, Vintage and tagged antenna coil, antique radio, capacitor, grunow, grunow 460, grunow radio restoration, old radio, repair, restoration, tombstone, tube radio, vacuum tube, vintage radio. Bookmark the permalink. 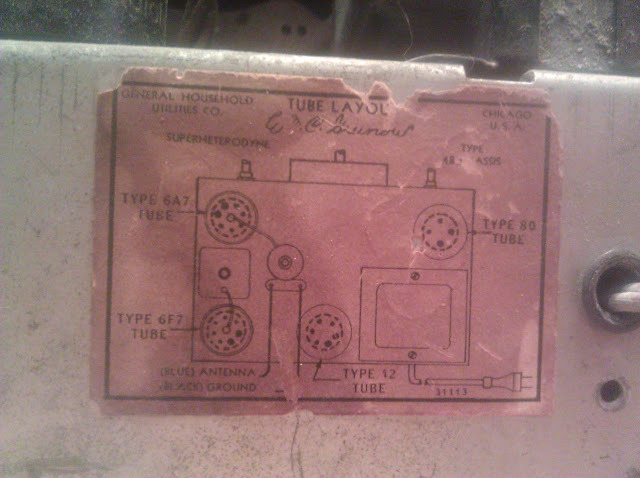 I have a Grunow superheterodyne chassis type 5R I would like to get some information about it? Hey I just found your blog as I was doing some research on my radio. I see your restoring and fix old radios. I have a Grunow 1241 ( 1935) I was going to sell and originally was just going to sell it for the nice cabinet and maybe someone could make it to hold a cd player or something but after seeing some like mine and really taking a good look at it I cant do it! It would be a shame! it’s in really good shape with one small area of the wood that has some damage on top but that can be fixed pretty easily. Its been stored in my aunts basement which is clean and not damp at all. ( it better not be the furnace and all our storage is down there) . The wood is so beautiful and honestly I’d just keep it and have it restored but I’m a sculptor and I live in a 400 Sq ft studio in the back of my aunts horse barn, lol so yea not happening. Originally her X got it from her friends husband to restore many years ago but ended up getting a divorce son after so its sat there all these years and now were cleaning an getting rid of things we don’t need. It has the radio in it but no speakers. 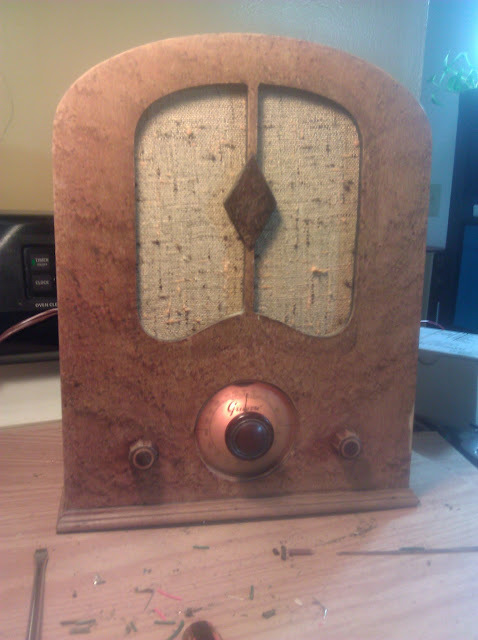 I have in a small bag the original wood dials and the round glass cover that goes over the radio face. It looks like they did put a new cord on it though but there is no material on the grill. I have no idea what they did restoration wise on the radio itself. I’d hate for someone to tear it up now. Would you by any chance be interested in it? I’m up in Stanwood. If you are interested email me back at solticestudio@gmail.com or if you know anyone who may want to buy it. I just can’t sell it now as a project for someone to cut up. I’m an antique lover and Love the style of this piece. I have always wanted to have a old radio in a nice wood console like this one, my uncle took my grandmother’s I remember as a kid years ago and had it restored and it’s really nice and since then I though I’d love one myself but, no room and a kiln comes first! lol but I like this one much bette than my uncles. I do have some pics I took yesterday if you want to see them. Or if you have nay ideas of the best way to sell it locally. I’d do ebay but I don’t want to ship this. Just to big! 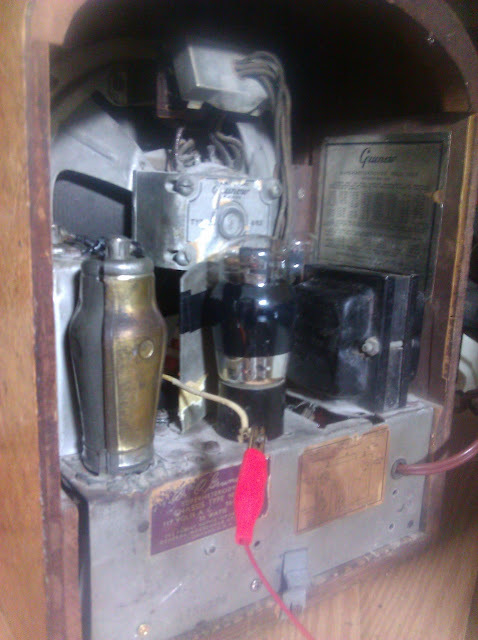 I’d love it to go to a radio collector and restorer.